Paddock Farm Butchery is planning a celebratory sausage event this Saturday to mark the first anniversary of their shop in Brailes. The butchers have produced a special range of sausages for the occasion with a sausage styled around each of the competing teams in the Six Nations Rugby Championship. 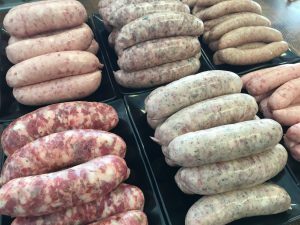 “Scotland’s pork and haggis sausage is my front runner,” says Nick Francis, one of the brothers that runs the farm and butchery business in Lower Brailes. “The Italian style fennel and chilli should also be popular, as should our best selling English style sausage – the traditional Tamworth. Wales’s sausage will be pork and leek, France’s will be Toulouse and Ireland will have a pork and Guiness variety. “We’ll be hosting a free BBQ and cooking tasters of all the sausage varieties so people can judge their favourites,” says Nick. “It’s just a bit of fun but it’s a great chance to mark our anniversary and thank all our loyal customers for their support in our first year. 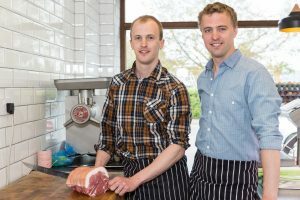 Nick and Jon Francis set up Paddock Farm in 2008 with a small herd of Tamworth pigs, supplying high quality pork direct to restaurants. They now supply more than 40 Michelin starred restaurants as well as local shoppers with their own-reared pork, plus locally raised beef and lamb, through the shop in Lower Brailes. The BBQ will be running from 9.30 until 12.00 with all proceeds going to Shipston Home Nursing. The butcher’s shop will be open as usual from 7.45am.